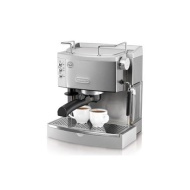 alaTest has collected and analyzed 183 reviews of DeLonghi EC 710. The average rating for this product is 4.2/5, compared to an average rating of 4.4/5 for other products in the same category for all reviews. People really like the design and performance. The maintenance and price are also appreciated, whereas there are some less positive comments about the size. There are some mixed opinions about the noise. We analyzed user and expert ratings, product age and more factors. Compared to other products in the same category the DeLonghi EC 710 is awarded an overall alaScore™ of 81/100 = Very good quality. Looks stylish, really easy to use and makes lovely coffees. This is a really nice coffee machine and it looks really stylish. We managed to get this half price in the sale so it was a real bargin! It produces lovely coffee with frothy milk. You do need to heat the milk before frothing it. Varible steam is very good. You can only get a very small cup to fit, so must use a esspreso glass or similar. i like to warm the mug i want to drink from. not too big to leave out on work surface. GREAT coffee. The children love the milk frother for hot chocolate. make sure you have the right size cups, mugs wont fit! We have found that large cups hold the same as a mug. The milk frother is great, just have to remember to remove and clean immediatly after use, if left takes longer to clean. Just makes a brilliant coffee. If you are making a cappucino, prepare the milk first otherwise the coffee can cool down too much. We found that Costa ground coffee gives the best results. Not so good at frothing the milk, there again I was expecting Costa standards. Found it works best without outside sleave part.